The start of this ride takes you along the Capital City Trail through the parklands of North Carlton and Royal Park to Flemington. You then travel through a Jeffrey Smart landscape under the elevated toll road known as Citilink. Turning into Footscray Road, you pass Melbourne’s busy container terminal. After crossing the Maribyrnong River you turn left and follow the river down to Williamstown. Williamstown is a historic old port with many attractive old buildings now converted to restaurants and cafes. Toilets are in short supply on this ride as are cafes. There is Park Street Dining on your right 1.3km after you start, then nothing until you reach Williamstown. There are plenty of cafes in Williamstown. This ride is on sealed paths and apart from one hill behind the Zoo, it is flat all way. Melbourne Ports from Bay Trail West. The ride starts on the south side of Rushall Station. At Bowen Crescent cross the road and continue through Princes Park, following the underpass under Royal Parade and emerging with sports ovals on your left, with the railway cutting to your right. Continue until you come to Royal Park Station on your right. Here the trail crosses the railway line, Poplar Road and the tramline. Immediately after the tramline turn left and continue along the trail, with the tram line and railway line on your left hand side. 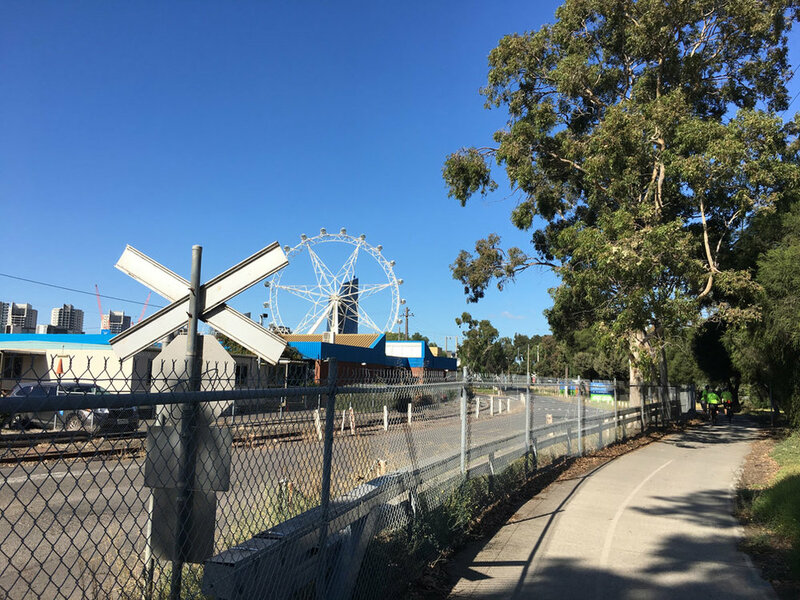 At Flemington Bridge Station the trail follows the ramp down to street level and then turns hard left to follow Moonee Ponds Creek, and the Moonee Ponds Creek Trail. Follow the trail, with the Moonee Ponds Creek to your right, passing under Arden Road and Dynon Road, until you reach Footscray Road. Cross Footscray Road and turn right (west). Continue down Footscray Road passing under Citylink via a left and crossing several roads. For the most part the path is alongside the road. Cross the Maribyrnong River. Immediately after crossing the river the path turns left and does a U-turn towards the river. Turn right at the river and follow the path to a canal next to Lyons Street. Turn right to follow the canal to Whitehall Street. Turn left at Whitehall Street and ride south to Somerville Road along the shared footpath. Note that Google Maps does not recognise the shared footpaths in Whitehall Street and Somerville Road. Turn right at Somerville Road and ride west on the shared footpath until you get to Hyde Street. Ride south down Hyde Street for about 1.5km on the shared footpath until it goes under the Westgate Freeway. You can stop here and pause for a moment to reflect on the 35 workers who lost their lives when the Westgate bridge collapsed during construction. The path now follows the Yarra River south. Just after the power station turn right on a shared path next to the carpark. Take the next left turn and swing left around the HMAS National Yarra Memorial. After refuelling in Williamstown continue riding down Nelson Place to Ann Street. Turn right at Ann Street and continue south until you get to Williamstown Station. by doing Bay Trail West and then doing this ride in reverse, or vice versa.